HALF MOON BAY, Calif. -- Half Moon Bay's geography on the Northern California coast is somewhat fitting. This small town is just under an hour from the faster-paced Bay Area, while its seaside golf links lie a little farther from the more heralded Monterey Peninsula. Tucked into a relatively isolated corner of the California coastline, Half Moon Bay remains close to those popular locales, but seemingly far away. 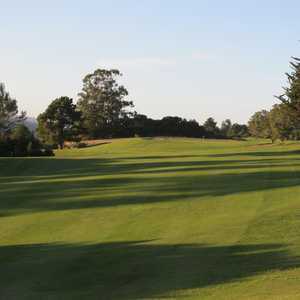 A view of the 18th fairway on the Old Course at Half Moon Bay Golf Links. As a golf destination, Half Moon Bay Golf Links remains mostly a well kept secret compared to those in Pebble Beach, Scotland and Ireland -- even Bandon, Ore., for that matter. But get a closer look at the two courses, and the accompanying Ritz-Carlton hotel, and you'll probably wonder why. Inspiration and visual splendor aren't hard to come by at Half Moon Bay Golf Links, especially while playing the finishing holes of either of the resort's two magnificent courses. Everything from the heather-like grasses lining the holes to the 19th century-style seaside resort standing on the edge of the ocean bluff reminds you of Ireland or Scotland 100 years ago; can it really be contemporary Northern California? Prior to the Ritz construction, it had been more than a decade since a resort had been built on the Northern California coast. Outside and in, the resort hardly resembles something built in the 21st century, but it was in spring 2001 that the Ritz-Carlton opened. Since then, this oceanside castle-hotel has complemented the two exquisite golf courses that stand nearby. Actually, the well respected Old Course at Half Moon Bay was built in 1973 and the slightly superior Ocean Course came along in 1997. Half Moon Bay's Ocean course was laid out by architect Arthur Hills, who also oversaw the redesign of the Old Course in 1999. Hills took full advantage of a natural setting that is one of the finest in California. He created a design that is Scottish links in its truest sense, as the term was coined for courses that serve as a "link" between the land and sea. At least from a distance, you can glimpse the Pacific from every hole. But the ocean doesn't come into play until the three finishing holes. Prior to that, the surf lurks beneath a delicate mask of heavy grasses and jagged cliffs. The 16th presents one of the tougher tee shots of the entire 18, a striking downhiller to a narrow fairway lined with fairway bunkers, ball-snatching rough and a watery grave for fierce snap hooks. The barranca coating the front of the green also threatens to swallow anything short of a well-intentioned approach shot. The 17th can compete with the many great par-3s to be found to the south on the Monterey Peninsula. It is a real knee-knocker from the 186-yard back tee. Ocean lies left of the seemingly tiny green, while two bunkers and heavy grass welcome anything not near the putting surface. The dreaded 16th and 17th though are nothing compared to the tee shot on the closing hole. If you weren't worried enough about losing your ball in the ocean, now you have to worry over drilling one of the tourists strolling along the coastal walkway on the left side of the hole. Nevertheless, the blind tee shot over the cliffs is a tremendous start to the par-5, which finishes neatly in front of the resort where waves splash on the beach sand below. Those final three holes are where potentially good rounds are either enhanced or end in a sputter. But the course as a whole is entirely manageable (when the wind isn't howling) at 6,732 yards from the back tee. And despite the occasional sweat-inspiring tee shot (notably, early in the round on the short par-4 second), most fairways are generous enough for resort players. 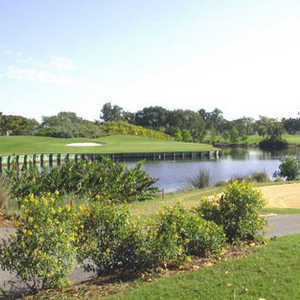 The course is also completely walkable, the best way to enjoy this dramatic landscape. The Old Course, originally designed by Francis Duane and Arnold Palmer, plays a little longer at 7,104 yards and has a robust rating of 75.0 from the back tees. Though it plays more inland than the Ocean Course, its 18th is a virtual masterpiece, as it runs downhill from tee to green along the sea cliffs, with the Ritz towering behind the green. The blend of the lush green golf hole with the rocky cliffs, marine blue and the foaming white of the surf is as stunning as anything you'll ever see. The Ritz-Carlton Half Moon Bay can compete with any of the top resorts in America, boasting 261 luxurious guest rooms, a deluxe Spa and lavish restaurant and bar areas. 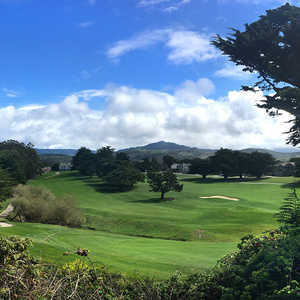 The Half Moon Bay golf spectacle can be seen through most guest room windows in the hotel and is also visible from dining areas. Restaurants include the Conservatory and the Navio. You'll also find a courtyard, complete with fire pit, wooden lounge chairs and Jacuzzi, very close to the 18th green. Be sure to stop off to sip a drink and watch the sun set behind golfers finishing up an afternoon round. While the impact of the resort as a whole is amazing -- the dramatic architecture, the shiny hardwood floors, the comfortable furnishings -- the friendliness of the staff will stick in your mind as well. The food and drinks are outstanding. You'll never forget the guest room trimmings like plush bathrobes, feather-soft beds you'll never want to rise from, milk and cookies set out for your arrival. If you can splurge, pay a little more for the Ritz-Carlton Club Level, located on the fifth floor. It's accessible only via private elevator key. Guests in the 50 Club Level rooms have a private lounge with a personal concierge staff and five complimentary food and drink presentations per day. The seaside community of just more than 11,000 remains mostly a farming town, known for its annual pumpkin festival and the Mavericks big-wave surfing haven. There are plenty of beaches and opportunities for deep sea fishing. I recently forked over 184.00 to play this so-called gem. The golf course was fun and challenging, unfortunately they don't do a very good job of marshalling this course....and because of this, I will NEVER play here again. Too bad.